Small modern kitchens walk the line between simplicity and functionality. 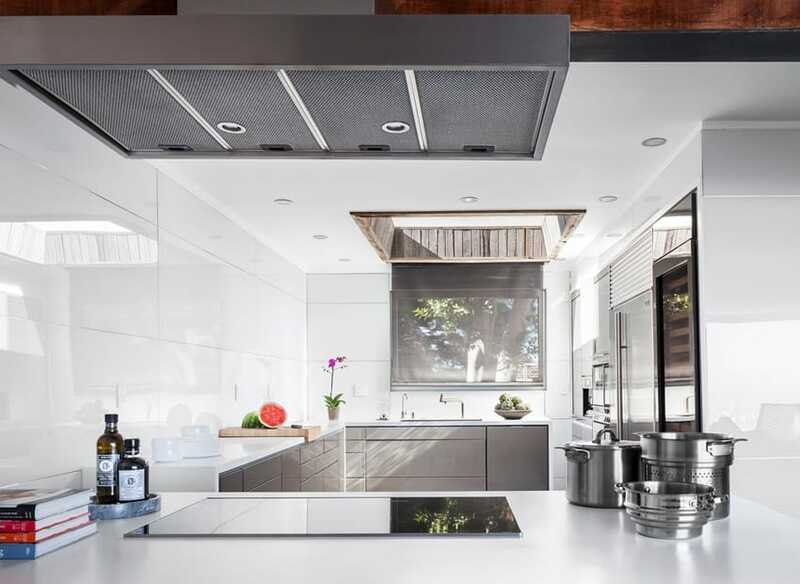 The stylish modern kitchens found in this picture gallery feature modern decor with small layouts. They focus on sleek finishes, with concealed storage and design intensive details. These small modern kitchens showcase different types of cabinets, countertops, and backsplash to help you decide which one you like best. With plain white walls and adequate natural lighting, the kitchen in the picture above goes for a bolder ebony-laminated cabinets with visible wood grains, adding texture to the space. This is paired with light gray solid surface counter top and backsplash and stainless steel pulls, giving it a nice sleek modern look. 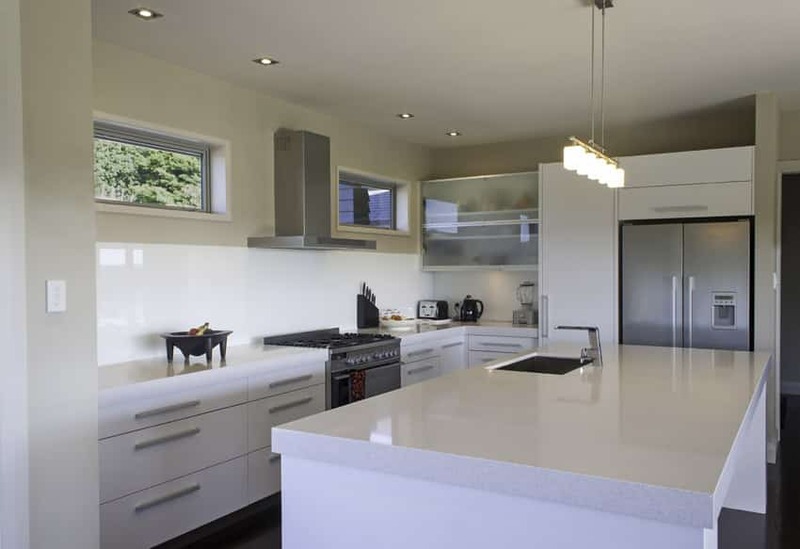 This is a modern kitchen design with basic wengue kitchen cabinets topped with white solid surface. The overhead cabinets are white and set against oatmeal colored walls, and the backsplash tiles used are black with white texture. 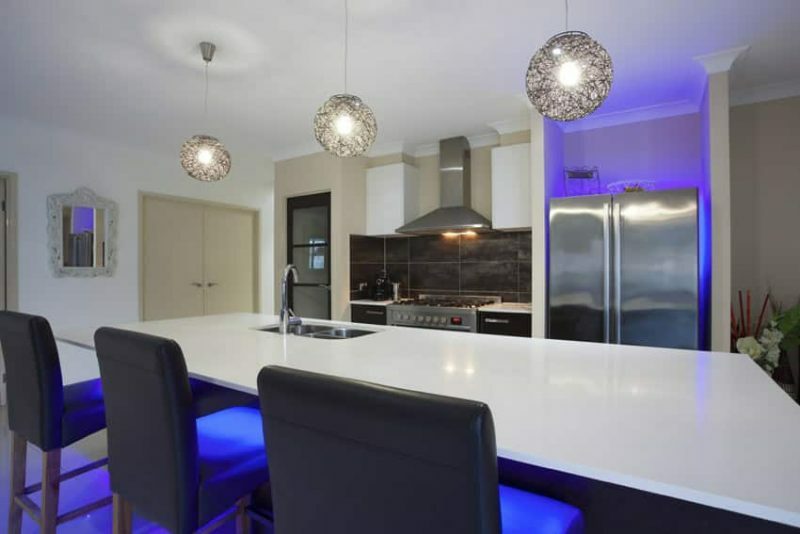 What makes this kitchen unique is the use of blue LED lights to add accent lighting for the back of the refrigerator and under the bar counter top. An all-white kitchen gives a nice clean & crisp look in just about any space. 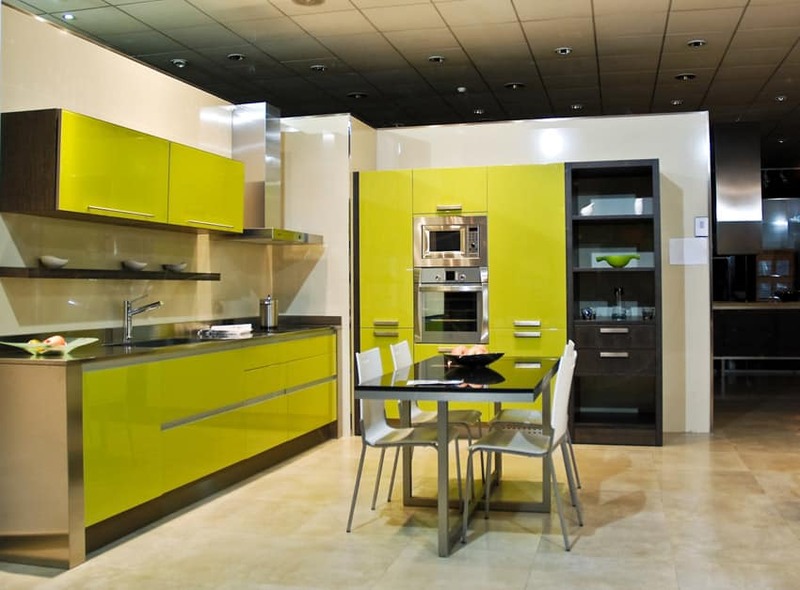 For this example, modern modular kitchen cabinets were used. The cabinets have matte white laminate finish and uses white quartztite countertop for that seamless finish with a little texture. The drawer pulls/handles are all i brushed stainless steel, matching the appliances and fixtures used in the space, and for the backsplash, white back-painted glass was used. Oatmeal-colored walls used in this kitchen help add a little warmth and color to the space without grabbing too much attention. The soft blue color of the walls gives us a bright and refreshing backdrop, making our small kitchen look cheery. The modern kitchen cabinets are all laminated in pearwood finish and topped with gray solid surface to match the white and gray ceramic tiles used on the backsplash. 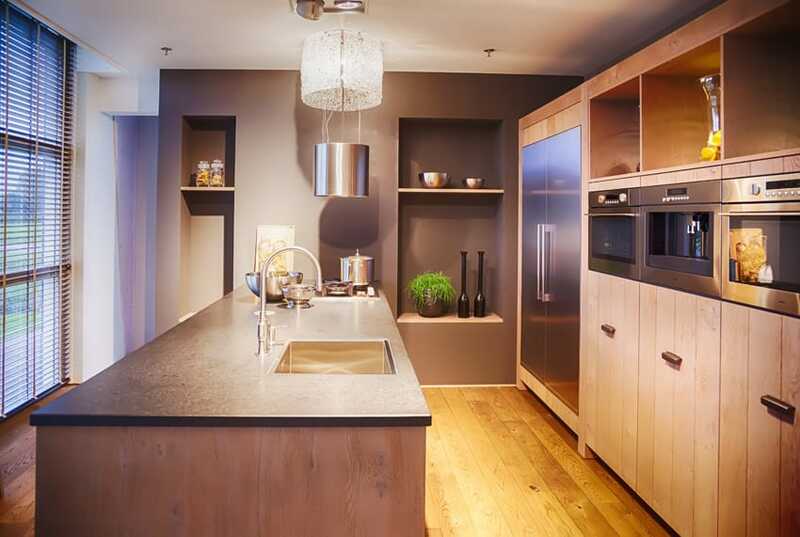 This kitchen highlights the natural beauty and appeal of natural wood. Instead of plain wood laminates, the doors in this kitchen uses vertical planks of colonial maple, adding both a vertical pattern to the space, and giving it a nice rustic appeal which works well with the gray walls and the textured charcoal countertop. This kitchen is a little small, but because the space has a high ceiling, it still looks wide and spacious. The architectural finishes of the space itself is very interesting. Instead of typical flooring materials such as tiles, wood or vinyl, the flooring material of choice is colored concrete. 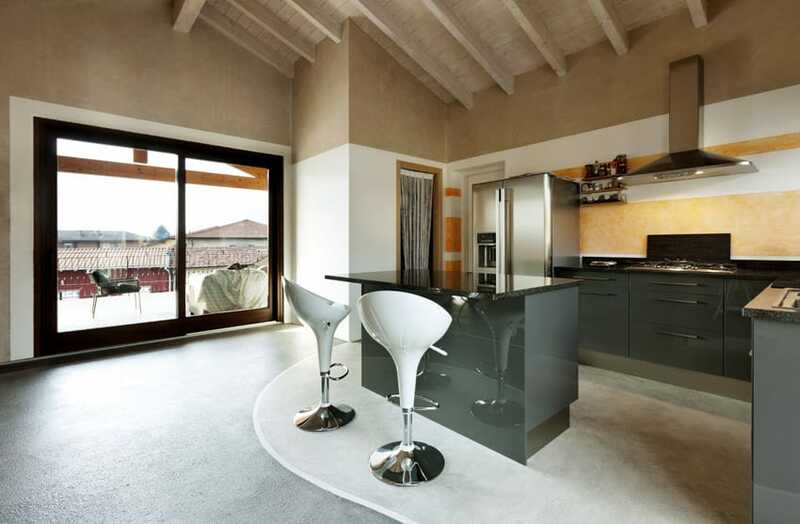 The concrete in the kitchen area is light gray in color, while the rest of the space is black. The finishing is a little rough as well, giving it a little grungy texture. For its walls, the color of choice is white, but the upper half of the wall is painted in a beige rag-rolled finish, pairing perfectly with the white weathered finished wood rafters and beams of the sloped ceiling. 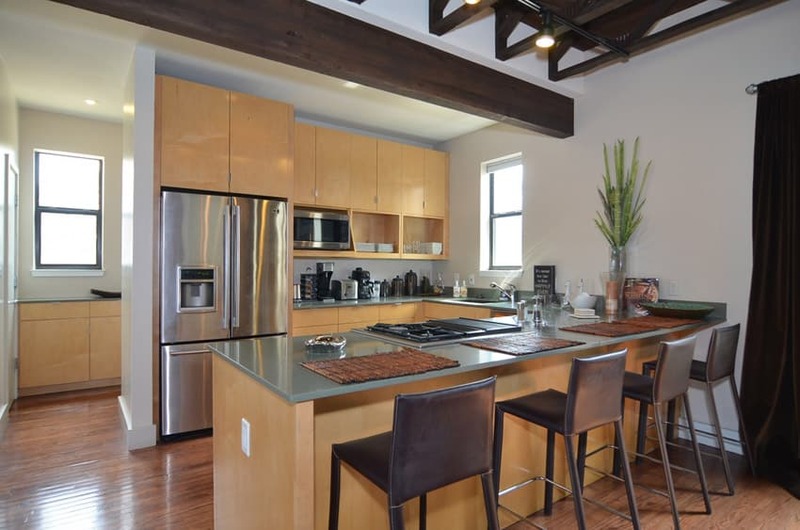 Despite the rustic appeal of the structure, the kitchen itself is very simple and modern. The modular cabinets are laminated in a high gloss dark gray color, accented by brushed stainless steel hardware and topped with black granite. White is one of the go-to cabinet color choice for modern kitchens. 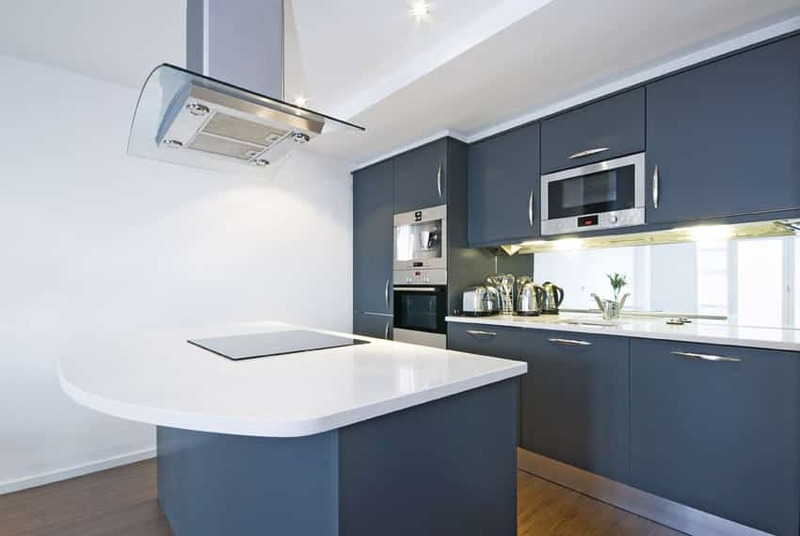 In this example, you will see that white high-gloss laminated cabinets were extensively used in this kitchen design, and even integrates a full wall of cabinets using plain white laminates. 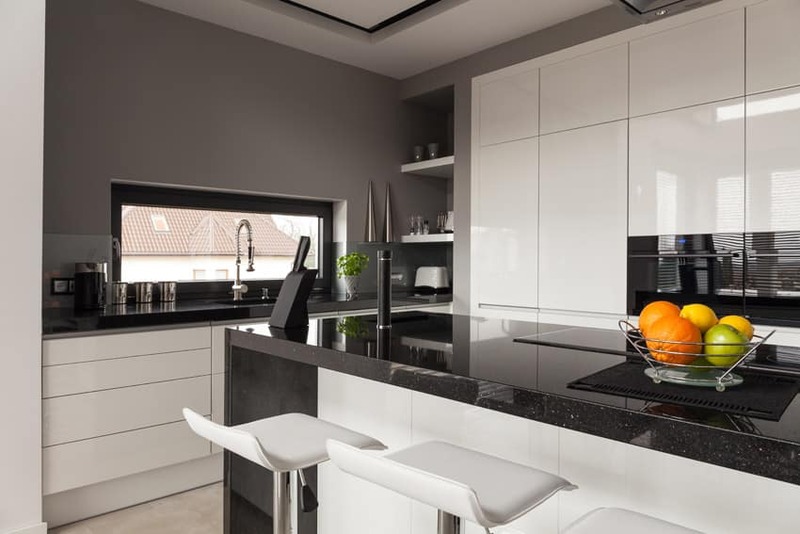 These white cabinets comes out well against the gray walls of the kitchen and the black galaxy granite of the counters as well, creating a bright and sleek-looking modern kitchen. 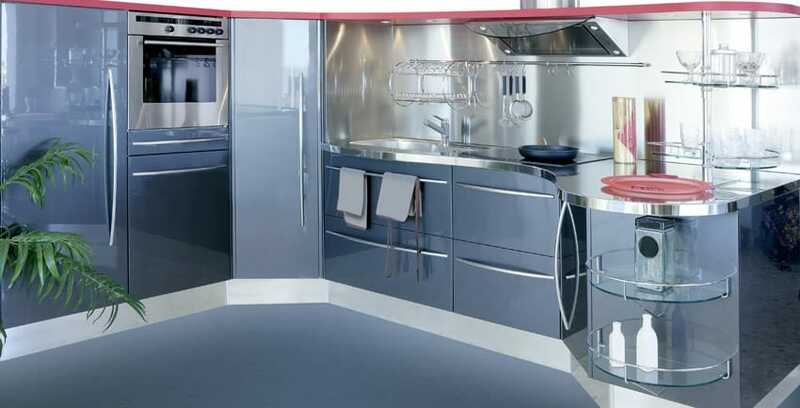 A small and compact kitchen design which effectively maximizes the limited space available. The modular kitchen cabinets are laminated in a glossy slate blue color and combines with stainless steel counter top and backsplash, giving it a reflective finish which is not only aesthetically pleasing & seamless, but easy to maintain and sanitize as well. Flat white paint on both walls and ceiling create the perfect blank canvas to work on. This small kitchen is situated in a semi-open area, in which the bar counter separates it from the rest of the house. Because the walls are plain white, we are able to use darker wood finishes without making the space look small and dark. The cabinets in this kitchen are made from ribbon-grain plywood and stained with dark walnut wood stain. This is paired with white solid surface counters and white glass subway tiles for the backsplash, adding an interesting element and pattern to its surface. This modern kitchen has a unique combination of colors and finishes. First off, the walls are painted in a nice light shade of lavender and even has lavender accent lighting on the drop ceiling. The kitchen cabinets, on the other hand, is very modern and simple – black high-gloss modular cabinets with stainless steel accents. The countertop is pure black solid surface as well. To add a little bit of texture, the backsplash tiles used in polished natural stone, giving it a natural pattern and color combinations. Walls are usually of matte or satin finish, but this kitchen has glossy-painted walls in a light oatmeal color, framed with stainless steel channels on every corner/edges. Since the walls are already glossy, the kitchen cabinets are in turn, of matte finish. The modular cabinets uses a unique combination of dark teak with matte yellow cabinet doors and drawer faces. The counter top material is brown solid surface which is a close match to the color of the teak-laminated cabinets. The pop of yellow against the warm wood tone create a fun and youthful atmosphere while retaining a sophisticated look because of its matte finish and the use of wood laminates. This small modern kitchen has excellent balance in all aspects. The combination of smooth and textured surfaces and the contrast of light and dark colors are all present in this design. Floors are natural solid Elm in a chevron pattern, while the accent wall of the kitchen has a textured brown wallpaper, creating a good contrast against the plain white kitchen cabinets and counter top. There simple plain white L-shape kitchen also has a bar counter/ledge in solid elm to match the flooring. One of the many advantages of using white kitchen cabinets is its ability to work well with other bolder accent colors. 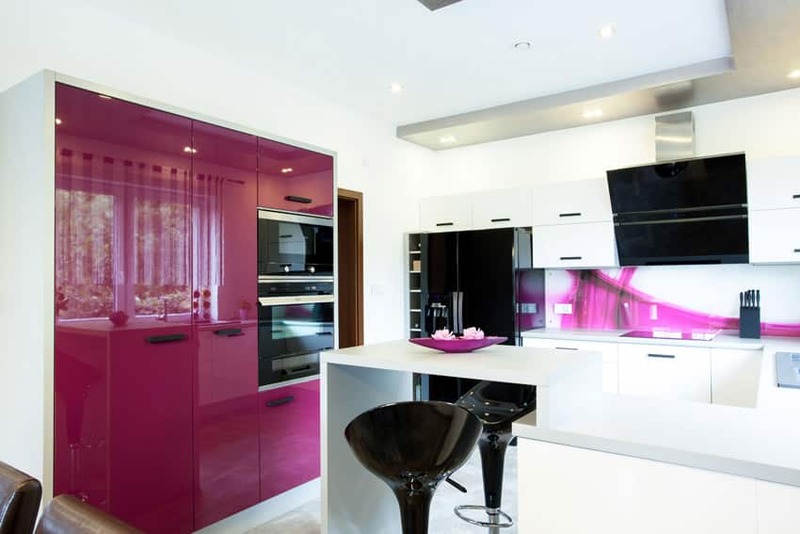 This example shows white kitchen cabinets and solid surface combined with fuchsia-laminated pantry cabinet and a laser-printed glass backsplash with fuchsia graphics. This creates a bold and fun kitchen space, making look youthful and fun, yet still keep its sleek modern look. This modern kitchen has a very uniquely shaped layout – it uses curved cabinets creating a very modern & futuristic appeal. The main surfaces are simple and basic – white walls combined with solid colonial maple floors. The kitchen cabinets on the other hand are all laminated in a very light oatmeal color in high gloss finish. The reflective surface of the cabinets help emphasize the modern appeal of the space, and the large mirror on the backsplash wall helps to visually make the space look bigger. Another substitute for black kitchen cabinets is slate blue. Slate blue gives you the same elegant & sophisticated appeal of black cabinets, but is not too dark. 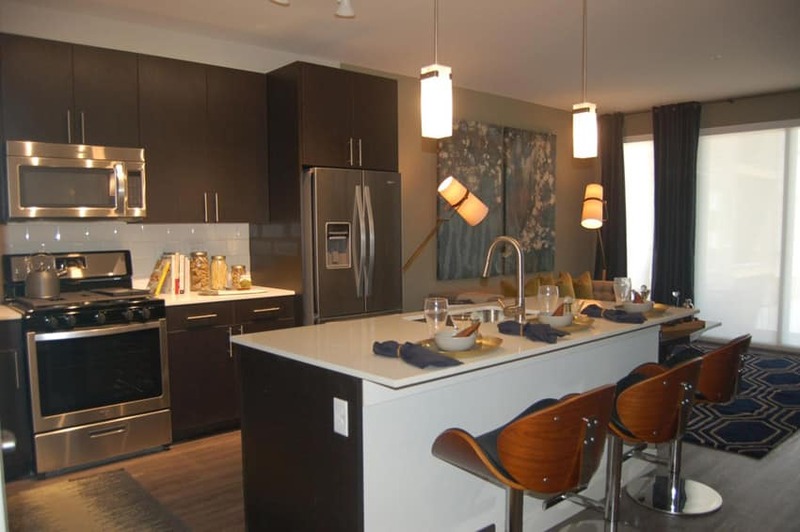 This is example features a simple kitchen with matte slate blue kitchen cabinets. Slate blue enables you to inject color to your space, but at the same time, provide flexibility like neutral colors as this shade of blue looks close to gray. Plain white solid surface was used. and for the backsplash, low-iron mirror was used, helping make the kitchen look more spacious. 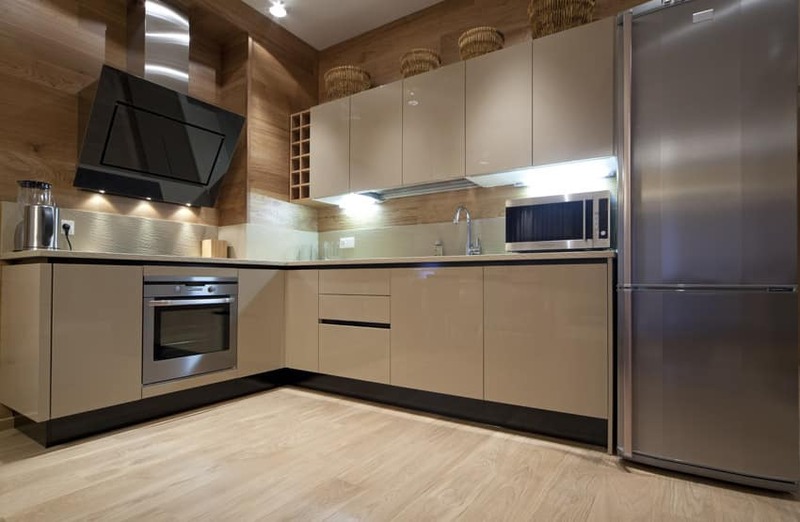 While wood laminates are typically applied on cabinets or floors, in this kitchen design, you will see the wood laminated are applied on the walls, giving the surface a natural warm feel. Since the floors and the walls are already in wood finish, the kitchen itself is kept simple by using off-white laminated modular kitchen cabinets topped with an off-white stone counter top with a unique rough finish. 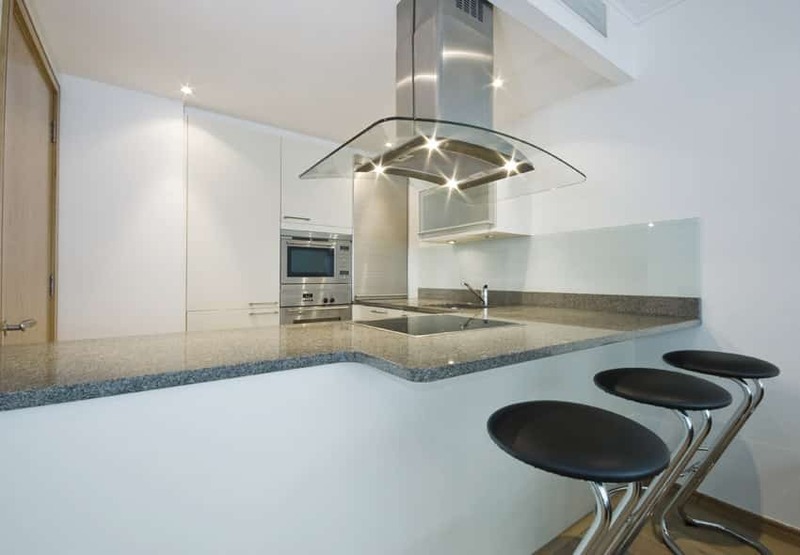 This is a very simple white U-shaped kitchen which effectively maximizes the available space. You can see that all cabinets are laminated in glossy white, and the countertop used is of a light gray color to add a little contrast. The wall area is divided into two, the other half a full storage/pantry wall, while the other half has overhead cabinets and white graphicote glass back splash. This kitchen design goes for a bold dark look. The cabinet carcass is laminated in a matte black color, matching teh small overhead cabinet which is also laminated in black. The cabinet doors on the other hand, are laminated a very dark mahogany color, giving it a dark wine color. This is topped with black galaxy granite, completing the sophisticated dark kitchen look. To avoid making the space too dark, this is countered by lighter colored walls and a light beige ceramic tiles used on the backsplash. This is a very small and simple kitchen with a built-in full wall storage laminated in off-white, and an L-shape counter with integrated bar counter. The counter top material is dark gray salt & pepper granite and this is paired with plain tempered glass backsplash. 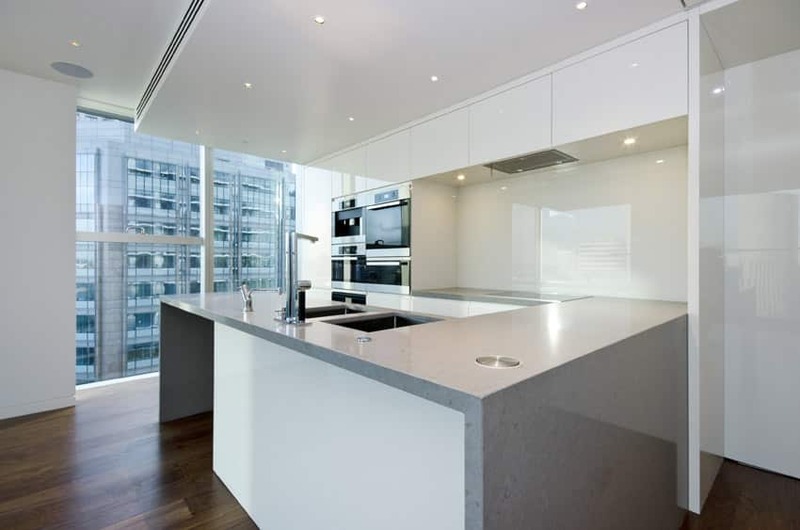 The cook top is placed right in front of the bar ledge/counter, allowing you to entertain your guests while you cook. This kitchen is warm and inviting with it choice of colors and elements. 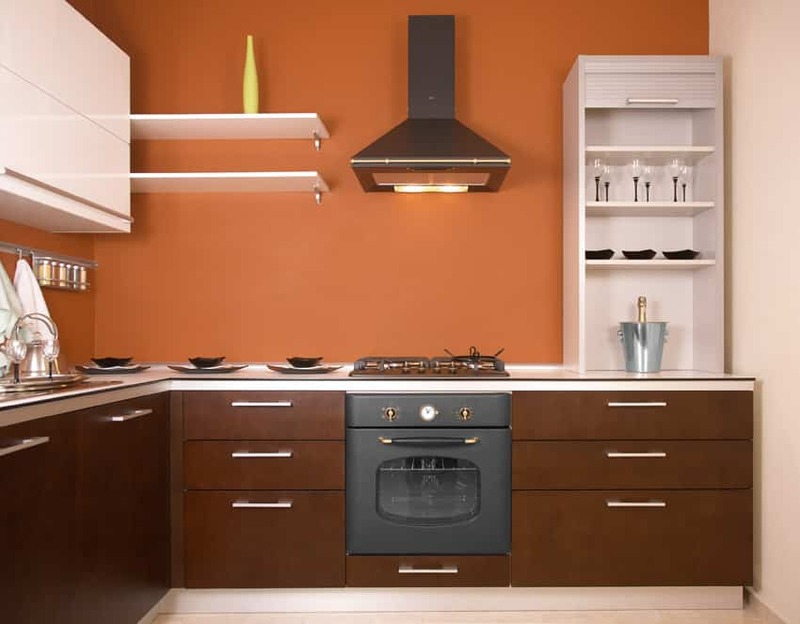 The base cabinets are in solid chocolate brown with aluminum handles, where an oven in matte black finish with gold accents lies in the middle. The countertop, like the overhead cabinets and shelves, are in solid white. The tangerine wall gives the room a warm and vibrant feel. 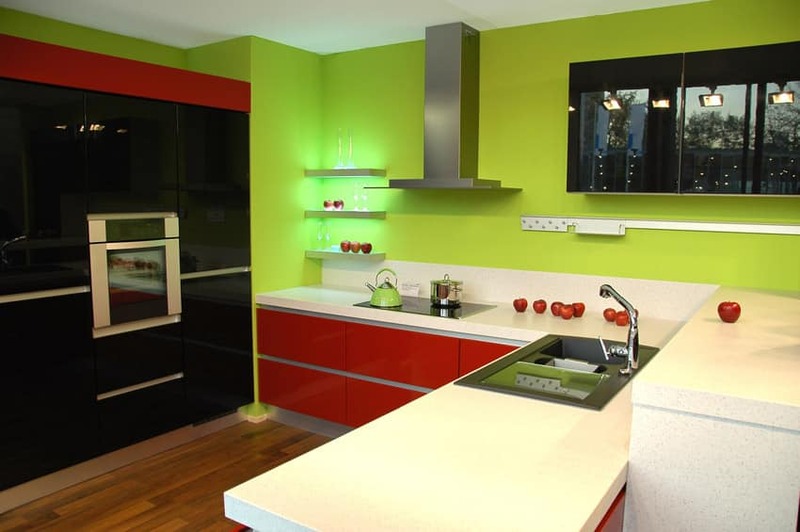 This small kitchen is all about colors – it uses a bold combination of bright lime green-colored walls with red, white and black kitchen design. The bright background easily catches your attention, and it also serves as a good contrast against the glossy black kitchen overhead cabinets and storage wall. 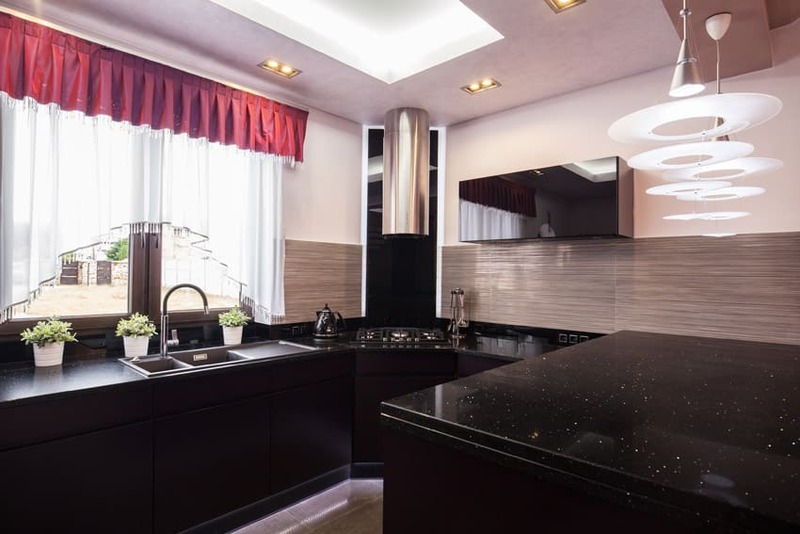 Because of the vivid quality of the wall color, it also contrasts well with the white quartztite countertops, as well as he red-laminated base cabinets. This is a simple modern galley kitchen with rosewood laminated cabinets topped with white soapstone and a matching soapstone backsplash. 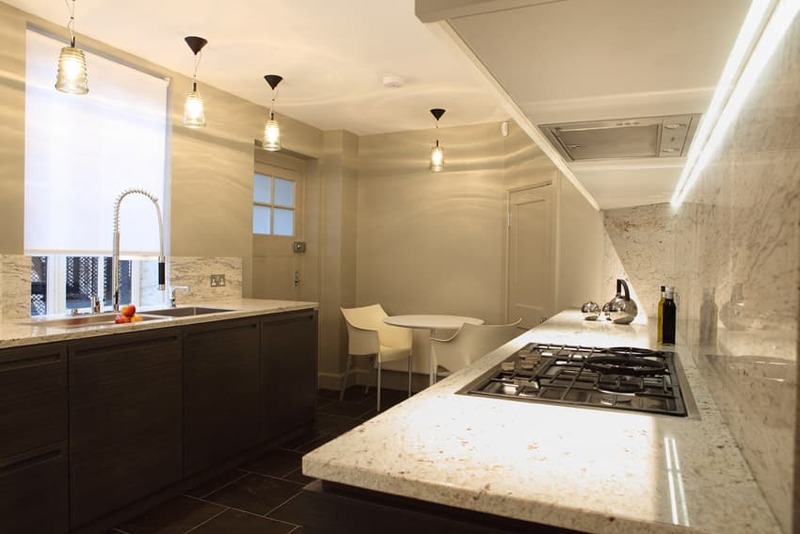 The overhead cabinets have integrated lighting, helping illuminate the worktop. The dark color of the cabinets has nice contrast placed against the light warm gray walls of the kitchen. This modern kitchen makes use of wengue stained wood cabinetry for most of its base cabinets and a tall one beside the refrigerator. The overhead cabinets on the other hand, are covered with frosted glass with an aluminum outline. 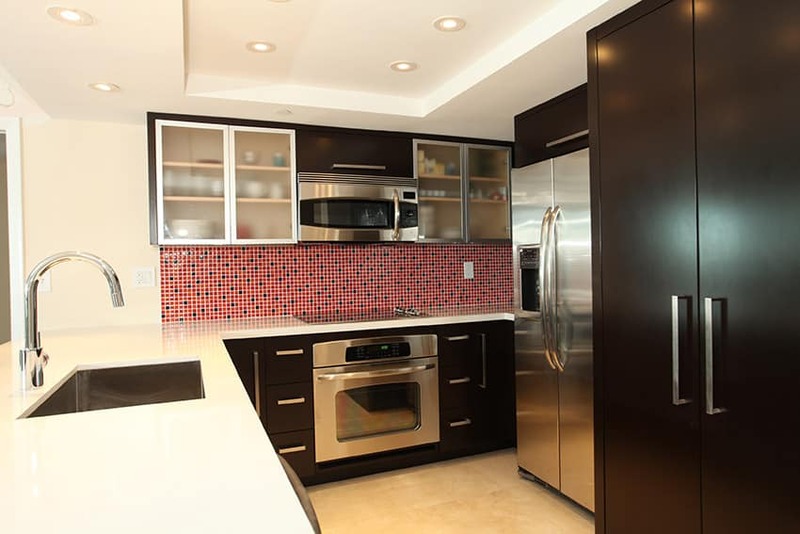 A good match to the stainless steel oven, refrigerator, stove, sink, and faucet/ The countertop matches the walls with a glossy solid white laminate, whle the backsplash is outlined with mosaic tiles in red and black. This beautiful kitchen may be small, but its creative use of space and positioning gives a lot of room for moving. The big windows that overlook the city make the room appear bigger. Instead of surrounding all corners with cabinetry, a kitchen island is used instead. The kitchen island makes use of glossy solid black laminates for the slanted countertop and the sides. The kitchen island’s base cabinetry has brown and gray laminates with metal handles that match the aluminum sink and faucet. 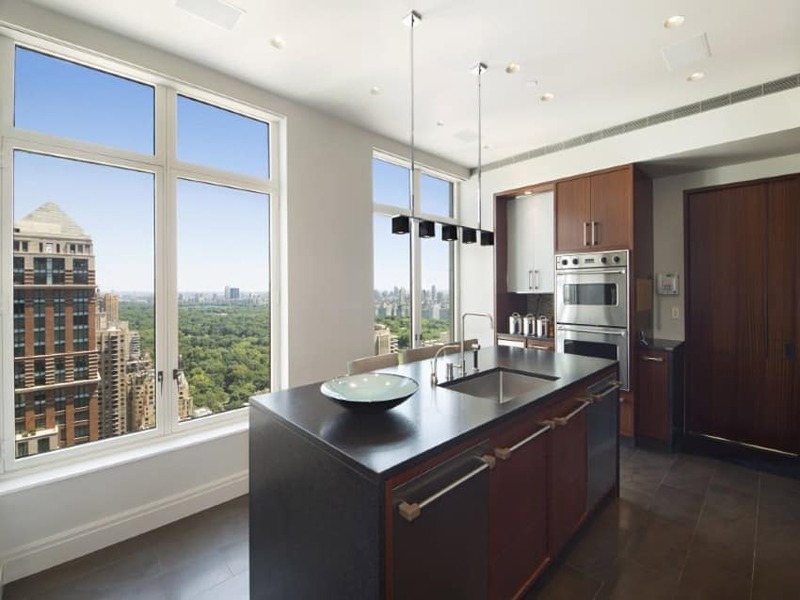 On the far right by the wall, more cabinets in mahogany and oak wood stains could be found together with an aluminum overhead cabinet on the corner and stainless steel ovens. 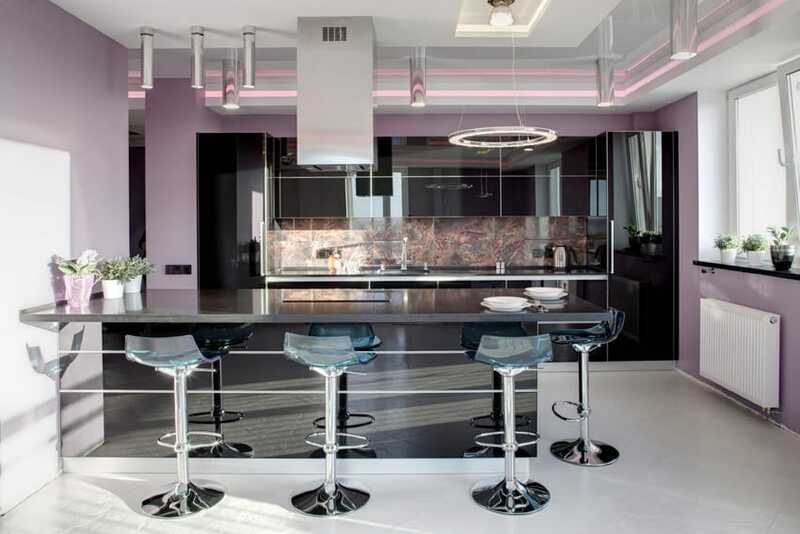 This modern kitchen makes use of neutral colors and exemplary lighting to create a beautiful space. The overhead and base cabinets by the wall are stained wengue, a good match to the gray walls on the living room beside it. 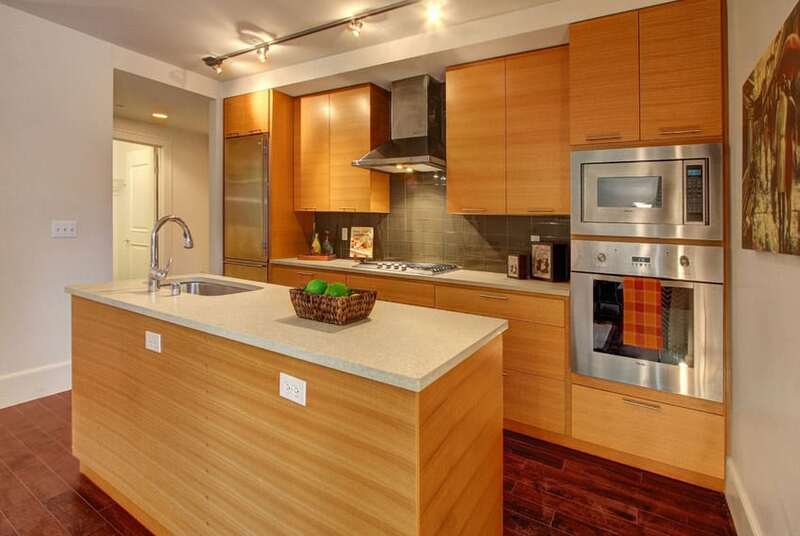 Stainless steel ovens and refrigerator accentuate the space. The backsplash and countertop are covered in solid glossy white laminates, an exact match to the white countertop on the kitchen island that holds a sink and has three wooden stools with a backrest in oakwood stain, gray upholstery, and stainless steel stand. 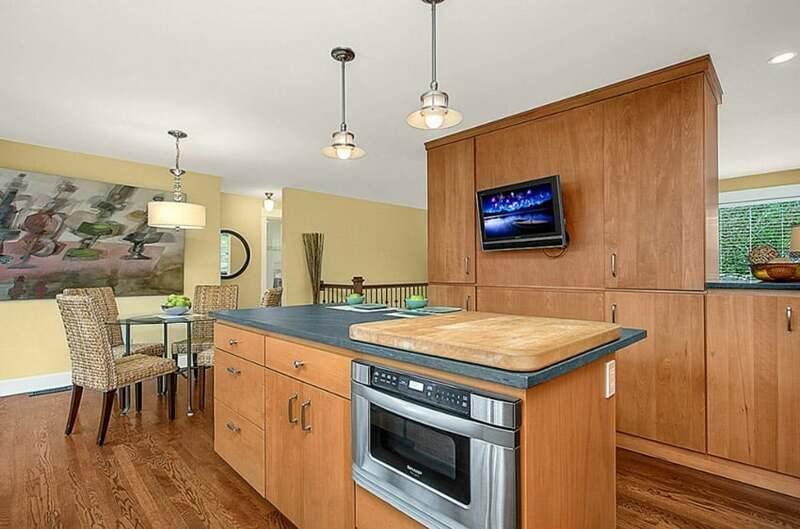 This kitchen isn’t large, but it appears to be so due to its openness. The big windows overlook the pool area and the sea. A kitchen island holds plenty of storage with its cabinetry in solid gray laminates with aluminum bar handles and the sink that lies on top of a gorgeous solid gray stone countertop. 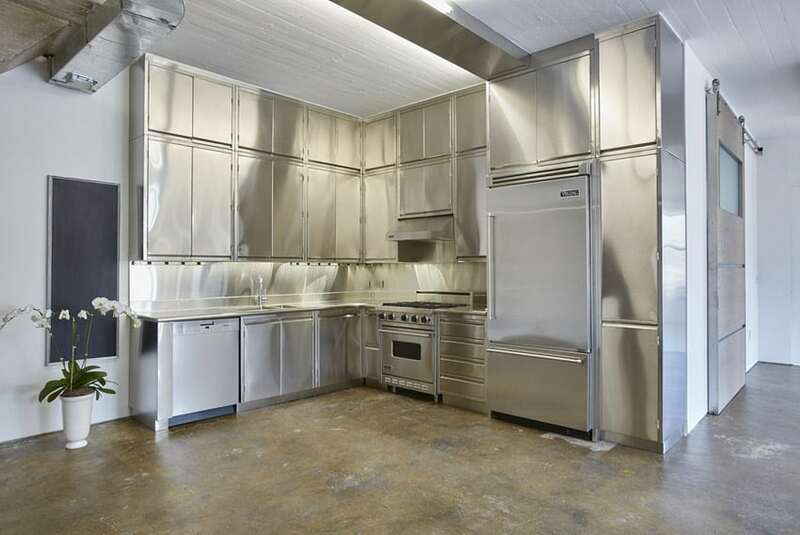 The stainless steel oven is embedded to the wall, aligned with some overhead cabinets for more storage. This small modern kitchen maxomizes space by filling the room with storage space through good cabinetry. The overhead cabinets by the wall are stained in oakwood. This side is where the stainless steel refrigerator lies alongside with the lower part of the overhead cabinets having see through glass panels that show the microwave inside. The countertop forms a U-shape and encloses the kitchen space. It is field with base cabinetry of the same stain underneath and a solid gray countertop. On the opposite side of the refrigerator, 4 chairs in deep mahogany are placed, allowing space for dining and lounging. This small and modern kitchen has white overhead cabinets that blend in with the white walls, backsplash, base cabinets, and countertop. 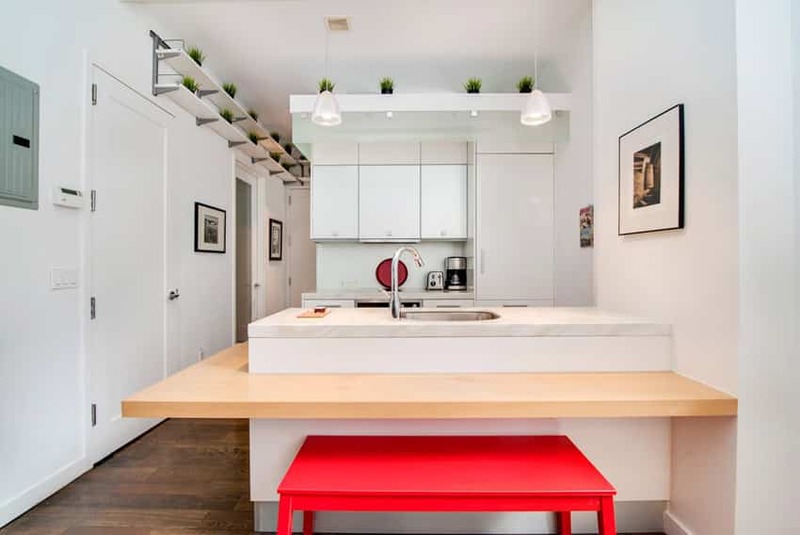 What gives life to the solid white colors are the ornamental plants near the ceiling, the stainless steel faucet and sink, a protruding oakwood stained bar surrounding the kitchen island that allows space for dining and the red bar stool under it. This small kitchen is dominated by wooden textures, Tall warm natural wood stained cabinets serve as both divider and storage area, where a flat screen TV is attached for entertainment. In front of it, a kitchen island lies, where base cabinets are at the bottom, beside the oven and a big wooden plank lies on top of the solid gray stone countertop. This kitchen is neat and well organized with its abundant cabinetry. 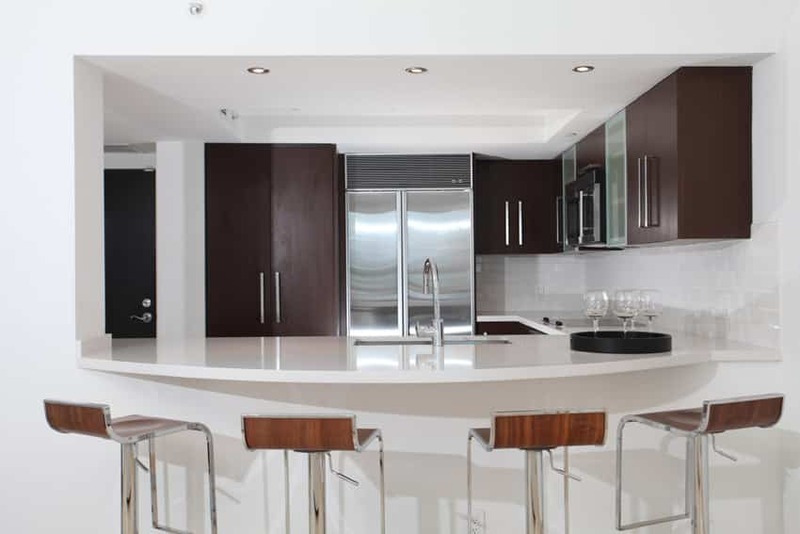 Solid white overhead cabinets surround the walls, contrasted by the textured wengue base cabinets. The countertop is in solid white, while the backsplash is covered with light gay tiles. 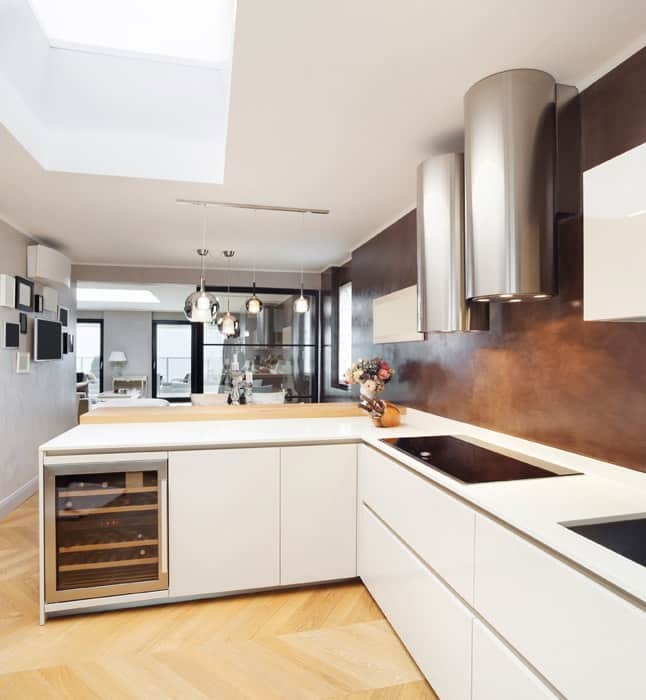 A kitchen island lies in the middle, where a the sink is placed on top of a solid and glossy white countertop with a white base and a protruding glossy brown wooden plank that serves as a space for dining. A metal stool with white upholstery is placed beside it. This kitchen looks more spacious than it is as it is covered with large white glossy tiles that reflect its surroundings. A skylight provides ample natural lighting during the day, together with the windows surrounded by black panels. 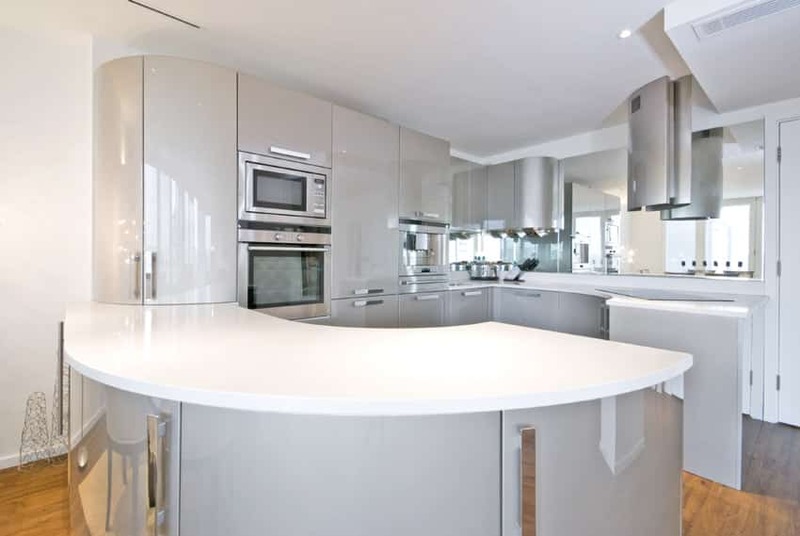 The countertops are in solid glossy white, and is contrasted by the seamless solid gray base cabinetry under it. The kitchen is kept neat, except for an ornamental orchid, some fruit, and kitchenware. This contemporary kitchen combines both rustic and modern design elements and materials to the space, creating a unique look. 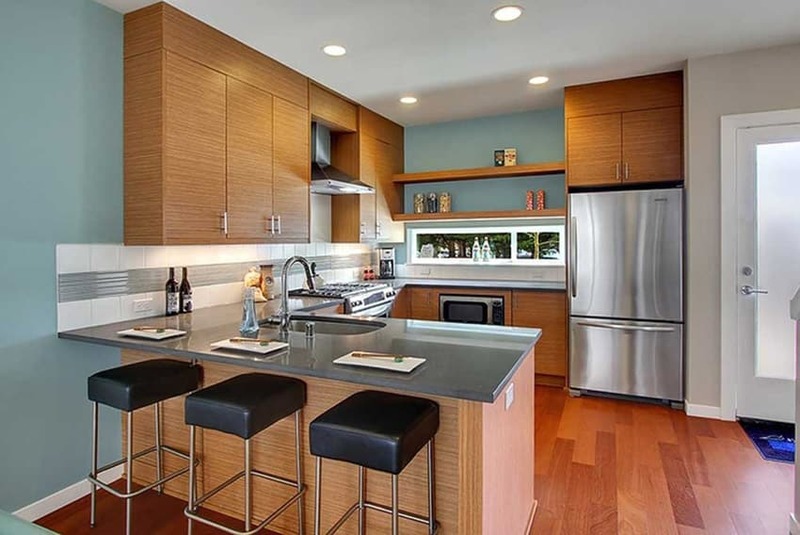 The kitchen cabinets are laminated in a weather wengue color, paired with white solid surface counter top, glass backsplash tiles and some stainless steel elements. The exposed solid teak wood columns and beams adds a unique rustic feel to the modern space, giving it a unique and refreshing appeal. This modern and contemporary kitchen design with an open layout and high ceiling design, making it look airy and spacious. For the modular kitchen cabinets & kitchen island, gray oak laminates were used and paired with white solid surface counter top. You will also notice an interesting storage idea for wine, as the wine rack/shelf was integrated to the side of the refrigerator. This luxury modern kitchen design adds a little bold twist to the minimalist aesthetics of the space while still keeping to the black and white color scheme. The kitchen cabinets use a combination of plan white laminated base cabinets and black sable laminated full height pantry cabinets & kitchen island. The counter top matches the color of the base, so the white kitchen cabinets uses white quartz, while the island with black base uses black quartz. 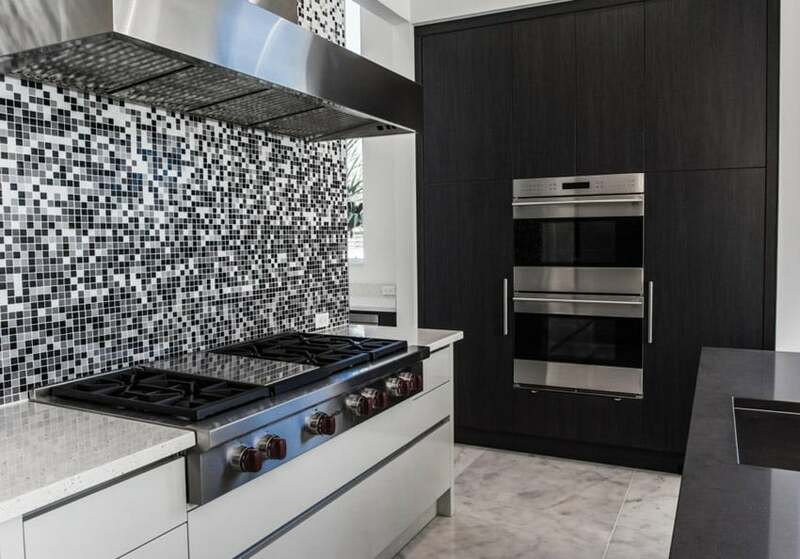 For the backsplash, a very bold-looking black, gray and white mosaic tiles were used, adding a large and eye-catching texture and pattern to the space, and also making it the focal point of the kitchen. 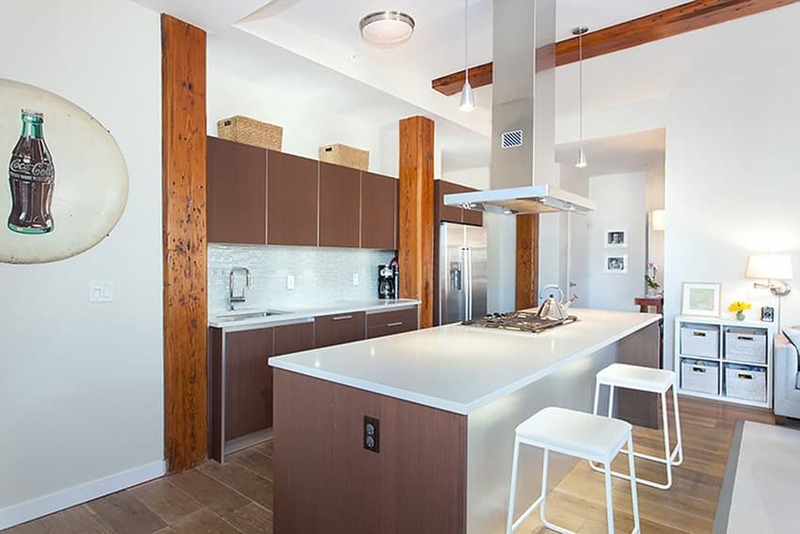 This kitchen has a rough industrial look, due to its choice of finishes. The floors are raw and rough, adding texture to the space, which is a nice contrast to the fully stainless steel kitchen. 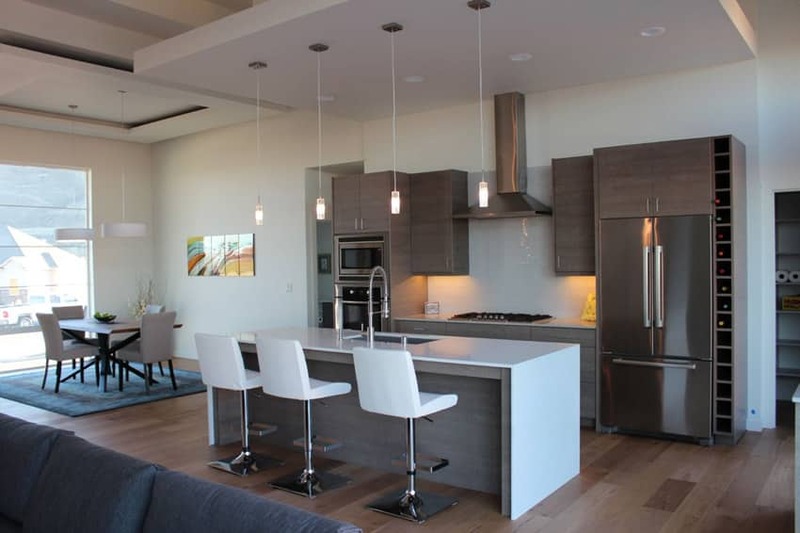 As you can see, the kitchen has the look of professional/commercial kitchens, as all kitchen cabinets, including its carcass, counter top and backsplash are made of stainless steel, making the stainless steel appliances blend in naturally as well. 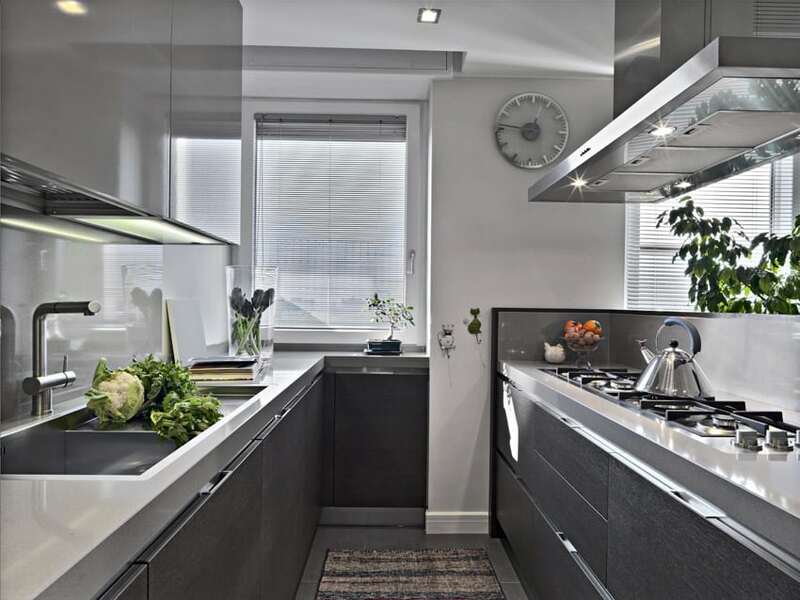 Using modern materials and finishes, this is a great basic modern kitchen design. 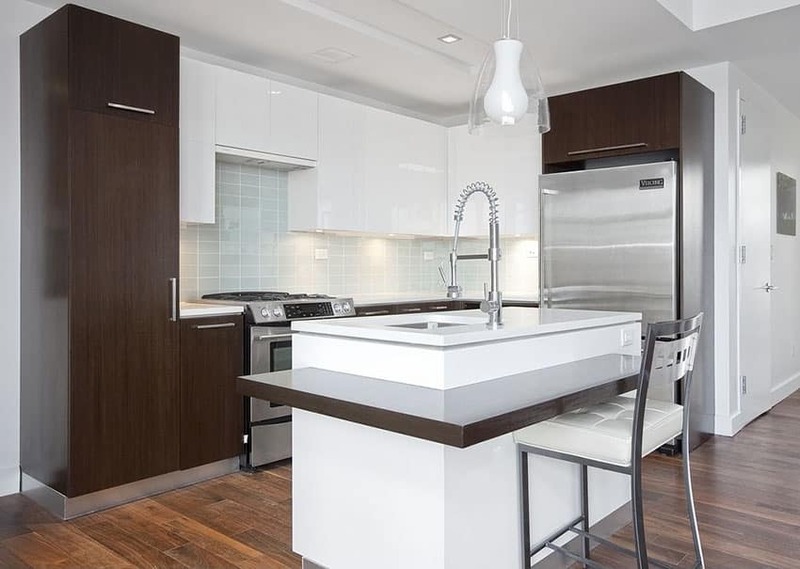 It uses Chestnut wood laminates for the cabinets and tops with with white quartz countertop. For the backsplash, it uses dark gray glass tiles, adding shine and gloss to the area, also making it easy to clean and maintain. See more pictures of modern kitchen islands here.